GRP roofing sheets use tough reinforced plastic to provide a lightweight roofing solution that offers brilliant longevity. These GRP sheets are also incredibly easy to install. They are therefore ideal for various applications, such as canopies and rooflights. 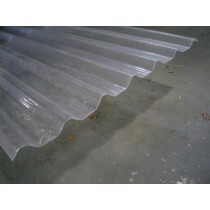 Roofing Megastore stock a growing range of GRP roofing sheets and GRP rooflights. These include the Corrapol range, which is designed to match the profile of Corrapol-BT sheets. Like all GRP sheets, these use glass fibres to extend the life of your roof beyond that which would be achieved by PVC alone. GRP roofing sheets are perfect for various roofing projects, such as sheds. Due to their strength and lifespan, they are also affordable alternatives to rooflights. GRP rooflights are also able to withstand the impact of direct sunlight. Have Questions About Our GRP Roofing Sheets? If you have questions about our range of glass reinforced plastic sheets or their use as GRP rooflights, speak to our team by telephone or via the online chat. With over 40 years of experience in roofing, we’ll help answer your questions about grp roofing sheets and GRP rooflights. We will also help you pick the necessary fixings and flashings for your project.Y ou can view all our roofing sheets here, which include PVC sheets.